We have already learnt about the stars, the Moon and planets. Our next astronomy topic covered the Earth. As our planet, the Earth is something we all know a lot about. 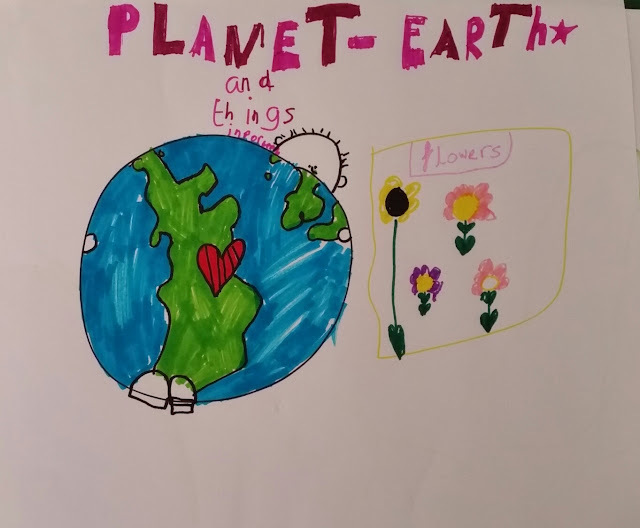 We started by thinking about all the things we love about our planet. D drew the above picture showing what she loves about our world. Next, we spoke about life on Earth and how it is the only planet which has life on it, as far as we know. We talked about what is needed for life to exist. 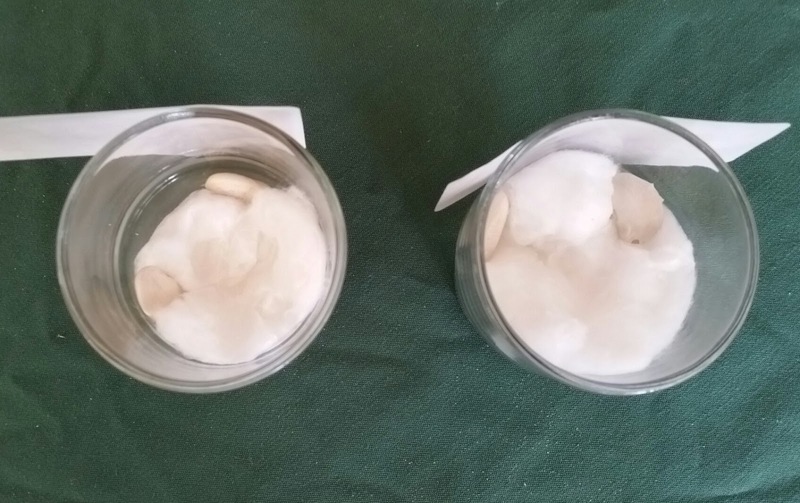 We planted some seeds to see how they would grow. 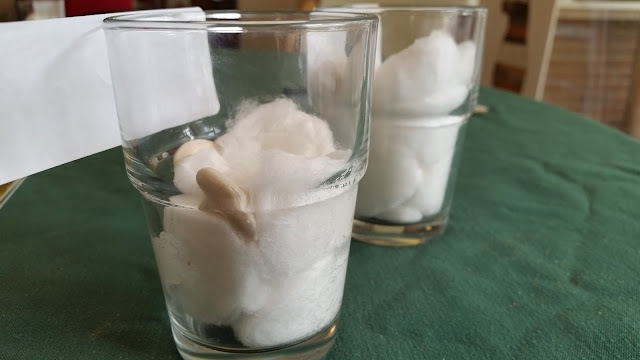 We planted the seeds in glass pots so we could watch the roots grow. 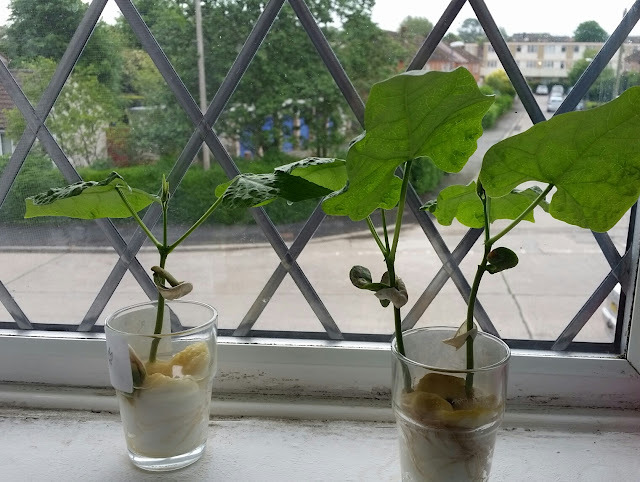 We put the pots on the windowsill and it was fascinating to see how they grew. The children enjoyed watering them every day and studied them for signs of growth. 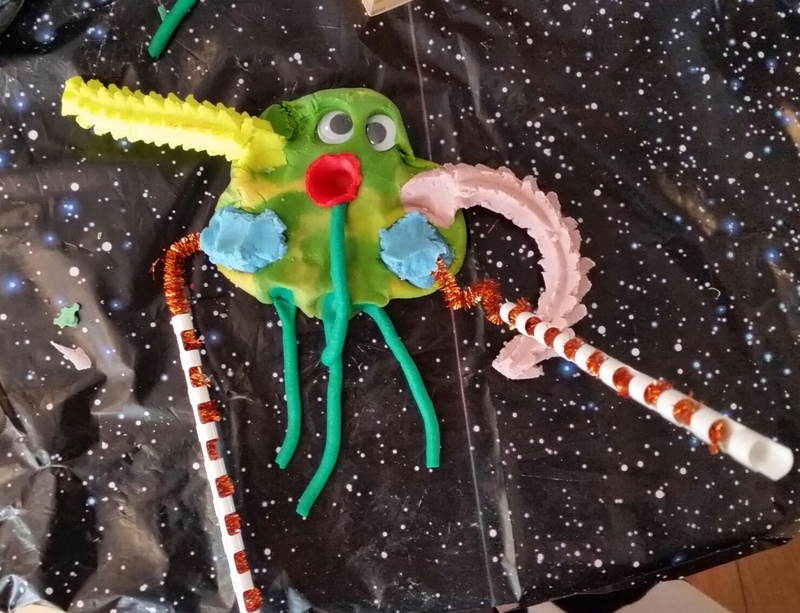 Next, we talked about how there may be life on other planets that we haven't yet discovered. 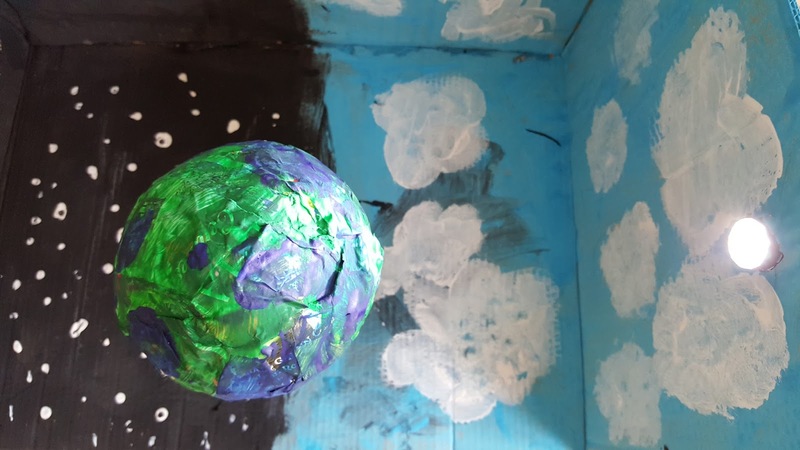 We used play dough to model what life might look like on other planets. 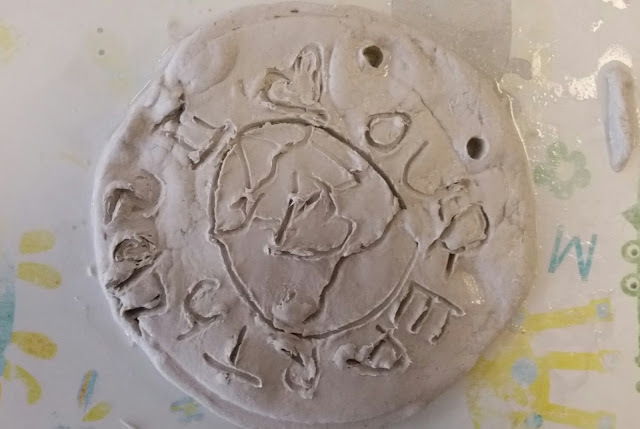 We then used modelling clay to make some keepsakes. 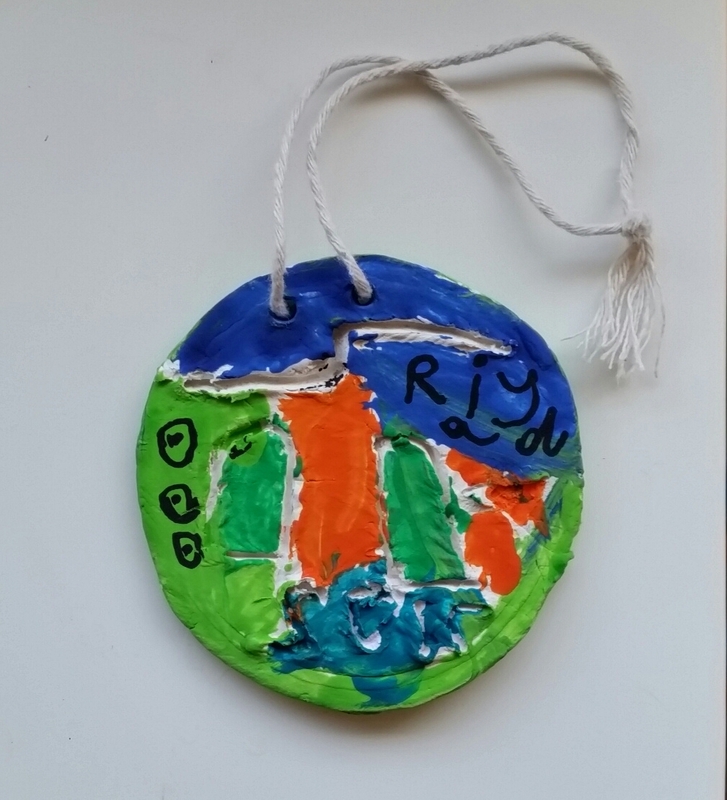 D carved the Earth in the middle of the keepsake and wrote,' I (heart) our Earth 2017'. 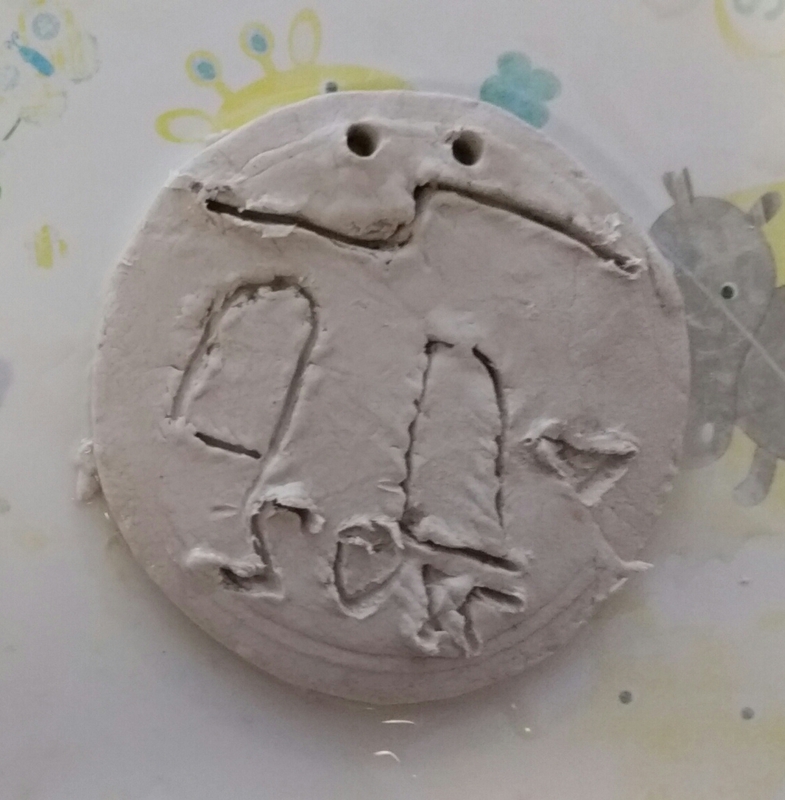 This is R's attempt. I am not quite sure what it is supposed to be but I think there is some lightning at the top! When the clay keepsakes were dry, the children painted them with poster paints. Then we threaded some string through the hole at the top to hang them up. 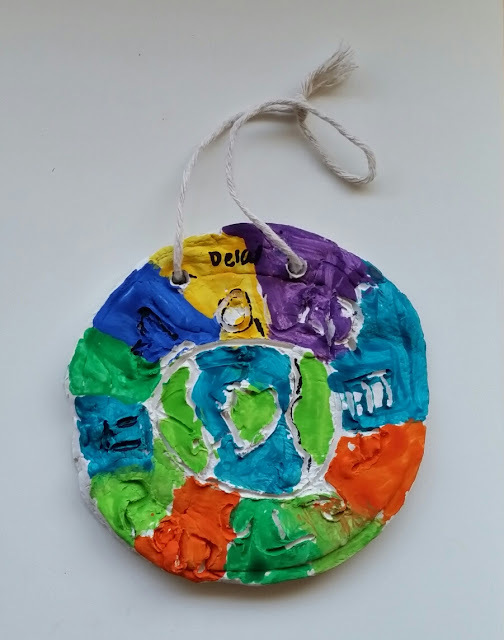 The children have now hung these up in their bedrooms. They make a lovely, bright and colourful decoration! 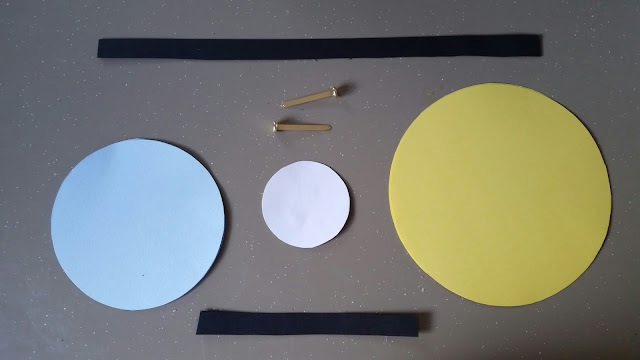 Then we made models to show how the Earth travels around the Sun and the Moon travels around the Earth. I explained how the Earth takes 365 days, one year, to travel around the Sun. The Moon takes 28 or 29 days to travel around the Earth and this is roughly how long a month is. Finally, we learnt about day and night. 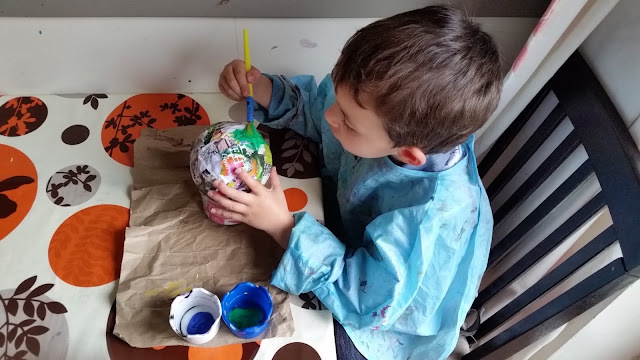 To do this we created a 3D model of the Earth out of papier mache. 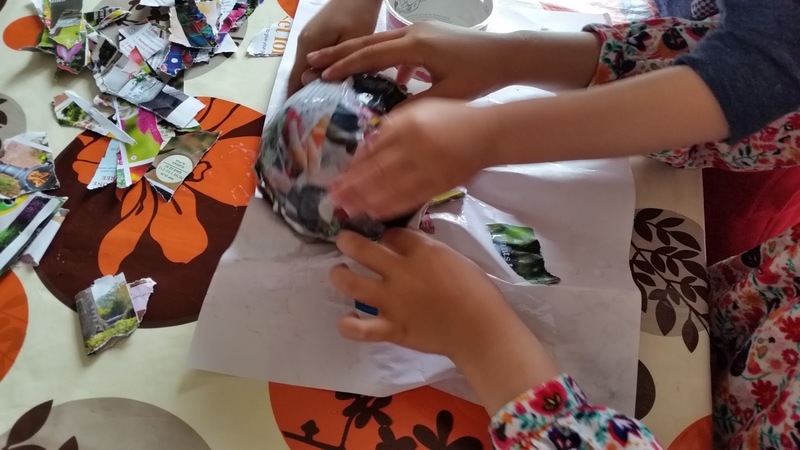 I gave the children a balloon and lots of strips of newspaper and they had great fun sticking the paper onto the balloon. Once it was dry, they painted it to look like the Earth. Here is the finished Earth. Next, I found a cardboard box and cut off some of the sides. 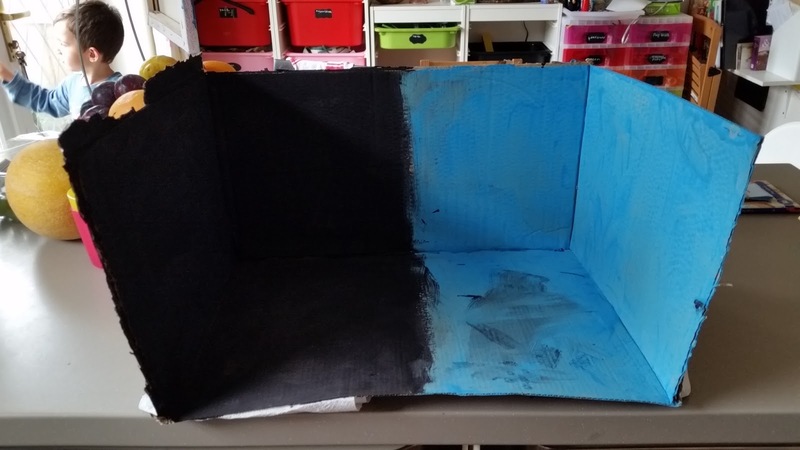 Then I asked the children to paint one half black and one half blue. 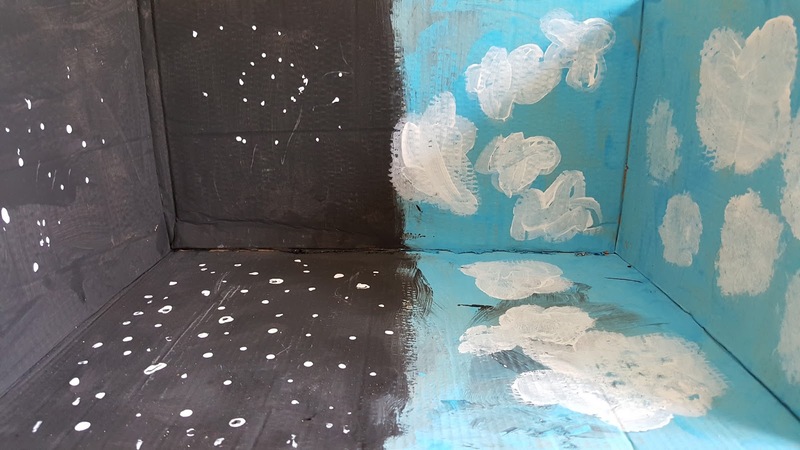 Once it was dry, the children painted clouds on the blue sky side and stars on the black night side. 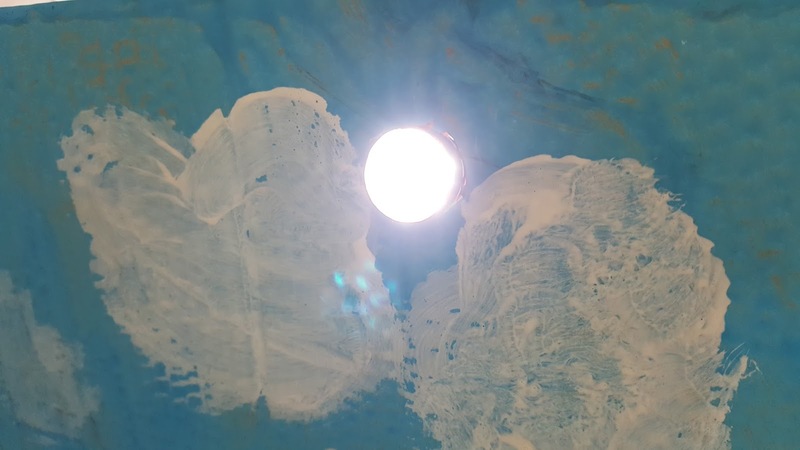 I cut a round hole out of the blue sky side of the box and pushed the end of a torch though it to make the Sun. Finally, we stuck a bamboo skewer into the Earth and secured it to the base of the box with some blue tac. 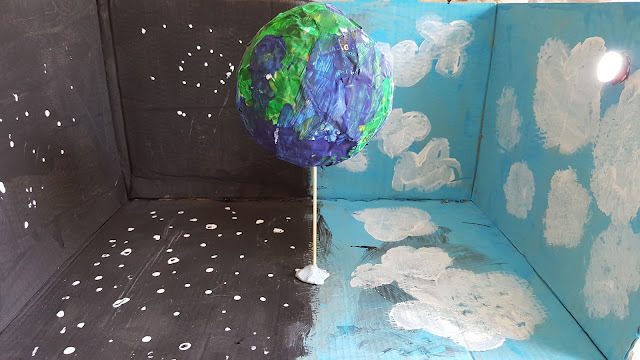 The Earth could easily turn round on the bamboo skewer so we could watch how this causes parts of the Earth to be in lit up with sunlight (daytime) while other parts are in the dark (nighttime). 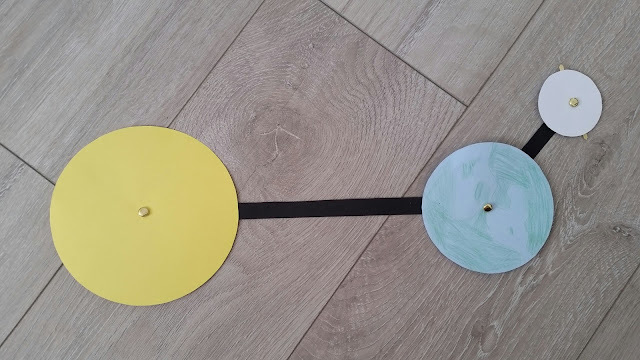 It helped to draw a coloured dot or place a sticker somewhere on the Earth and watch how it moved from being facing the Sun to facing away from the Sun. This aerial view shows more clearly how one side of the Earth is light and the other side is dark. This model made it so easy for the children to understand about day and night. Ah such lovely fun stuff to do! My kids would love this... pinned! 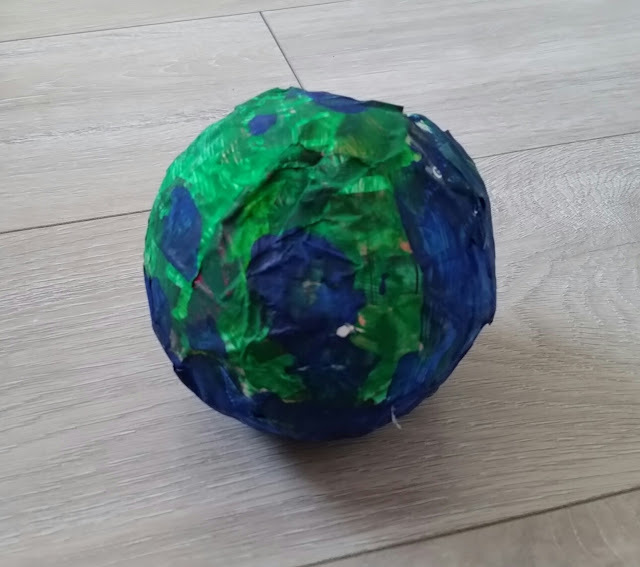 I love your model of the Earth. Such a good way to see how it all works. I bet they won't forget the day they made the Earth. 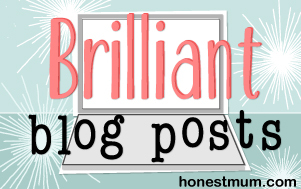 Making learning memorable is one of my aims!